Major League Baseball starts today! Oh and it's Easter. But tonight the Red Sox face the Yankees in the first game of the 2010 season and I'm very excited. 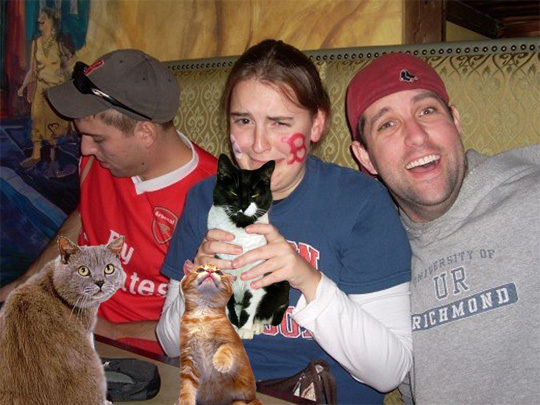 This is a picture of Emily and her Red Sox loving friends. They are all very sad because their team isn't very good. Although I hope they beat the Yankees tonight, they don't have any hope of winning the World Series because that honor is reserved for the Phillies this year. You might want to paint an "A" and a "D" after that "B" on your face. I did not know that using my picture would be an excuse for you to disparage America’s greatest ball club. Could somebody explane me, what does it mean? These funny people with strange cats. This cats look not like they are alive. Is it joke? The Worst Cook in America: Rachel Coleman!